This very brief photofilm (1:41 minutes) shares the story of Misku Abafaris, a woman farmer in Ethiopia, who was interviewed in 2010 about the changes in her life as a result of interventions by an ILRI-led Improving Productivity and Market Success of Ethiopian Farmers (IPMS) project. Since 2006, ILRI has been working closely with Ethiopia’s Ministry of Agriculture and Rural Development to improve farmers’ livelihoods. In short, her daily routine in Gudeta, a small village some 30 minutes’ walk from a tarmac road, was little different from that of earlier generations of women in Ethiopia’s Oromiya Region. There were good years, when the coffee harvest was plentiful, and bad years, when the coffee failed or drought shrivelled their food crops. Five of Misku’s children still live at home, chickens still wander in and out of their mud-walled, tin-roofed dwelling, and it’s still a long walk to the nearest well to get drinking water. But new ideas and new approaches, so lacking in the past, have recently helped to transform their lives. Their most obvious manifestation can be seen in the fields below the village, where half a dozen handsome sheep are being fattened for the market. ‘With the profits I’ve made from my sheep, I’ve been able to buy a Boran heifer, which will yield much more milk than our local breed of cow’, says Misku, ‘and last year, when we didn’t get a coffee harvest, we still made enough money from the sheep to pay all our household expenses.’ She’s particularly proud of the fact that her sheep-fattening business has paid for her eldest daughter, now 21 years old, to live and study in the nearby town of Agora. Misku’s forgotten to tell you about the chairs we’re sitting on’, says Abafaris Abamaliky, her husband. ‘It was the money from the sheep that paid for the timber and the carpentry. And it paid for the wooden box where I now keep my clothes and my private things.’ The pride he takes in his wife’s achievement is plain to see. Misku and her husband are among tens of thousands of farmers to benefit from a project which has helped them to improve the productivity of their livestock and crops and—crucially—market their produce more effectively. 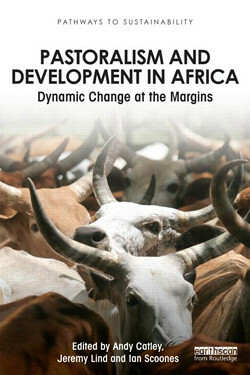 Funded by the Canadian International Development Agency (CIDA) and managed by the International Livestock Research Institute (ILRI) on behalf of the Ministry of Agriculture and Rural Development, the Improving Productivity and Market Success of Ethiopian Farmers (IPMS) project was launched in 2006. Goma, where Misku and her family live, is one of 10 districts where the project operates. The early stages involved the identification of crops and livestock which could benefit from activities to improve production and marketing. This followed lengthy consultations with farmers and local government staff. In Goma the focus has been on improving ‘value chains’—linking production, the supply of farm inputs and the markets—for coffee, poultry, honey, fruit and sheep. ‘Many farmers were keen to develop sheep fattening, but they didn’t have the knowledge or skills to improve production’, explains Yisehak Baredo, the project’s research and development officer in Goma. ‘Their sheep were in poor health, and it took them up to a year to fatten them.’ Misku’s experience was typical: she used to keep just one sheep, whose only food supplement was kitchen scraps, and she made hardly any money fattening its lambs. 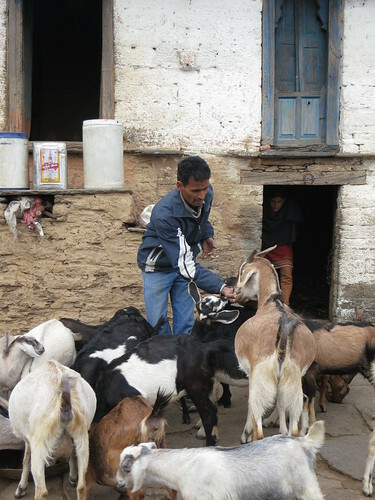 In 2008, the project provided training on sheep fattening for Misku and 119 other farmers. They learned, among other things, about the importance of providing their animals with protein-rich food supplements and how to keep them in good health. Such was the success of the first training program that the project repeated the exercise for 92 farmers a year later. None of this would have been possible without access to credit, which was provided through a local microfinance institution. Talk to any of the farmers who benefited and they’ll tell you in great detail precisely how they spent their first loans. Misku borrowed 1500 birr (USD115). With this she bought five young sheep, a supply of cotton-seed meal, life insurance for herself and insurance for her five sheep, and de-wormers and other veterinary medicines. Three months later, she sold the fattened sheep and paid back the loan, leaving her a net profit of 1200 birr (USD90)—a considerable sum of money in one of the poorest countries in the world. Subsequent fattening cycles have provided her with similar profit margins. So is her story unusual? Yes and no. 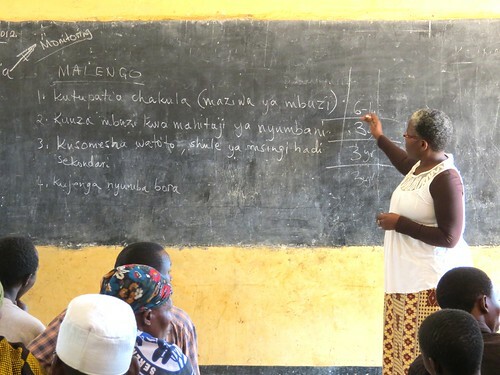 Yes, in the sense that she is a strong and respected leader, and the group of 30 smallholders which she chairs was immediately able to repay its loans in full—something several other groups failed to achieve. As a result, the microfinance institution has been happy to provide further loans. And no, in the sense that many other farmers have made a success of fattening their sheep and increasing their income. Over four out of five who received training shortened the fattening period to just three months. ‘With the profits I’ve made from the sheep, we’ve built an extension to our house and bought a high-yielding Boran cow’, says Suchare Abamaliky, one of Misku’s neighbours. Musa Kadir, who belongs to the same peasant association, has used the profits from his sheep to pay school fees for his children. ‘I’m now earning as much money in three months as I used to make in a year from the sale of coffee beans’, he says. He has ambitious plans to expand the number of sheep he fattens, and he’s also begun to raise avocado and mango seedlings, having observed the activities of one of his neighbours. Shito Nasir had received training on how to graft superior varieties of fruit tree. ‘I could see she was making such a good business that I decided to do the same’, explains Musa Kadir. This is the way new ideas are beginning to spread, across hedges and fields from farmer to farmer. Abafaris Abamaliky is some 20 years older than his wife, Misku, and he has lived, as he puts it, through three governments. Life is now better than it ever was in the past, he says. ‘We now have electric light in the village and better health care.’ Just as importantly, he and his neighbours now feel they can talk openly to government officials. Indeed, the success of the IPMS project owes much to the close relationship between villagers and the staff at the district offices of the Ministry of Agriculture and Rural Development. Although the IPMS project will come to an end at the end of this year (2012), its impact is assured. ‘You can already see the knowledge being transmitted from farmer to farmer’, says Tsegaye Umeta, Goma’s district administrator, ‘and local government staff will continue to promote the knowledge and practices introduced by IPMS to new areas.’ It shouldn’t be a hard sell: when farmers are making good money, others will follow where they lead. And already, new businesses have sprung up to provide feed, fertilisers, medicines, beehives and other equipment. If you ask Misku about her hopes for the future, she lists her priorities without hesitation. ‘My first desire is to support my children, so they can go to college’, she says. ‘Then, if God is willing, I would like a better house, with a cement floor, not a mud floor like this one, and with brick walls painted a nice colour. I’d also like a well.’ A while ago, she went on a farmers’ study trip to the capital, where she saw a small pump for drawing well water. ‘I’d like that too’, she says. But is this a dream too far for a family which has just three hectares of land, a pair of oxen, two cows, ten chickens and a small flock of sheep? ‘No’, she replies. ‘If we continue to work hard, I’m sure this will happen.’ Her husband nods in agreement. As we leave the village, we are accompanied by a chattering crowd of children, including Misku’s eight-year-old boy. When Ariso is not at school, he helps to look after the family’s sheep, but he also has a lamb of his own, which he recently bought with money he earned picking coffee. ‘Once I have fattened it up’, he says, ‘I will make a good profit.’ He probably hasn’t heard of ‘value chains’, but he is very much his mother’s son: he understands the importance of the market. Story and photofilm by Charlie Pye-Smith. 1 Gebremichael’s story: Changing the fortunes of farmers in Ethiopia through better livestock feed, 28 May 2012 (story and photofilm). 2 Saving the plains: ILRI research team wins Sustainability Science Award for its pastoral research in Masailand, 7 Jun 2012 (story). 3 The connection between animal disease and human health, 13 Jan 2012 (photofilm). 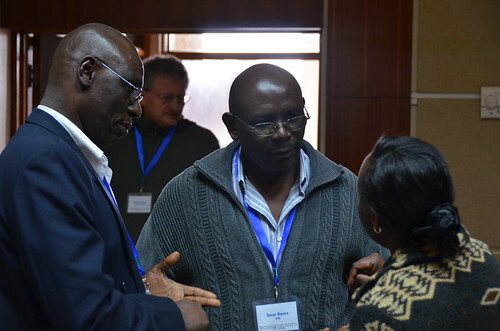 Watch this brief ILRI video (run-time under 7 minutes) of quick comments made by six participants following a recent inception workshop hosted by ILRI to plan work in eastern and southern Africa by the CGIAR Research Program on Dryland Systems. Excerpts of the filmed interviews follow. There’s been lots of discussions on what we call the ‘impact pathway’—how do we get our research products and research outputs to have an impact on the lives of tens of millions of people who live in these drylands? We’re trying to get to what are the desirable developmental outcomes of this program and what research outputs will contribute to those outcomes. As we move into the more marginal areas, issues of risk, vulnerability and resilience become much more important and we have to tread much more carefully intensifying those kinds of systems. It’s not us researchers who have to bear the risk; it’s the farmers or pastoralists who are engaged in them. So we have quite a lot of responsibility. Farmers with vulnerable livelihoods have to be risk averse. If we produce technologies that don’t account for that, then we run into this longstanding problem of lack of adoption. There’s no point our doing the research if it can’t be adopted. And that’s why we want to tie research outputs to developmental outcomes. This meeting has brought all these different disciplines together, which is what’s necessary. It resonates with what I’m trying to work on, which is ecosystem-scale planning. If you want to protect ecosystems as the basis of life, as the basis of food or other kind of welfare, you can’t approach them from different sectors. You have to treat them as one thing, one entity, and figure out how to manage them as such. And people don’t deal well with that sort of complexity, especially when you add people and livelihoods and economies into the mix. That’s far too complex for people to handle; they need much more simple things to deal with. I think this meeting might take us towards that, not just to have tools or research but to have people who can think across all the different systems and at the necessary scale. One of the challenges and opportunities of these new CGIAR research programs is determining how research can be better integrated into the development process. We have been too separate in the past. That integration necessarily is going to involve partnerships. You can’t work with everybody, so there’s going to have to be some whittling down to a number of partnerships that actually work. But that’s one of the opportunities of these new CGIAR research programs. We have to consider the whole value chain and to begin to think of how to remove barriers and bottlenecks in the value chain. We need to take the research into farmer’s lives, and to do that we need partnerships that can make this work. Several factors are responsible for technologies not being adopted by farmers. 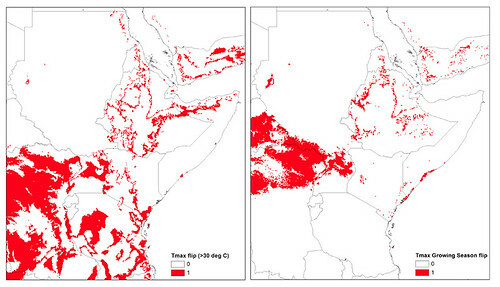 In Malawi, like in other countries of Africa, the landholding size is small—on average, one hectare. From that one hectare, the smallholder farmer is supposed to produce enough to eat, and at the same time, to have money to send the children to school and to hospital. The key drivers of adoption of technology by the smallholder farmer are the principles of extension, which are: The farmer wants to see, the farmer wants to hear, and the farmer wants to touch. Iain Wright is an animal nutritionist with 30 years of experience in developing agricultural systems for both agricultural and environmental objectives, the effect of policy on livestock systems and the role of agriculture in rural development; Wright is director of People, Livestock and the Environment Theme, one of ILRI’s three global research themes, and is based in Addis Ababa, where he also serves as ILRI’s representative to Ethiopia. Peter Thorne, also based in Addis Ababa, is a crop-livestock systems scientist with expertise in feed, water, information and other resources needed by smallholder mixed crop-livestock farmers. 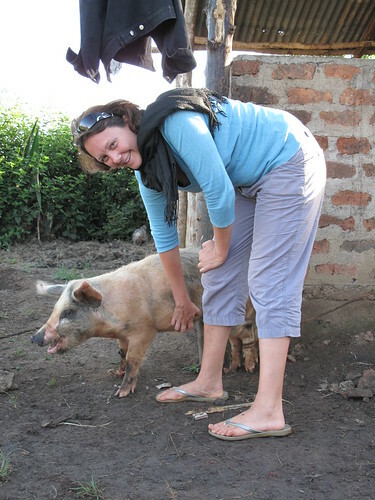 Formerly working for the Natural Resources Institute, at the University of Greenwich, in Kent, UK, Thorne joined ILRI’s People, Livestock and Environment Theme at the beginning of 2012. Jonathan Davies, an agricultural economist specializing in rangeland ecology and nomadic pastoralism, heads the Global Drylands Program at IUCN, in Nairobi, which works to overturn the widely held belief that drylands are wastelands by providing evidence that conservation of drylands, which cover 40 per cent of the earth’s surface, is critical not only to millions of their inhabitants but also to our global environment. John Lynam, formerly of the Rockefeller Foundation and an independent Nairobi-based consultant since 2000, has worked for three decades for smallholder-led agricultural development in Latin America, Africa and Asia within diverse programs and approaches, from commodities to farming systems to natural resource management. Florence Wambugu, a plant scientist and biotechnology expert and the founder, director and chief executive officer of the non-profit, Nairobi-based Africa Harvest Biotech Foundation International, has won numerous awards and served on many distinguished boards of directors due to her longstanding work and commitment to increase food production in Africa. Wycliffe Kumwenda is with the National Smallholder Farmers’ Association of Malawi, which, through a network of smallholder-owned business organizations, promotes farming as a business, develops the commercial capacity of its members and enhances their productivity. ILRI Clippings Blog: Hunger in Sahel worsens as ‘lean season’ begins: ‘The worst is yet to come’, 14 Jun 2012. CGIAR Research Program on Drylands Systems website. Goats rest before the Himalayan mountain range in Kothera Village, Gangolihat, in India’s northern state of Uttarakhand (photo credit: ILRI/Susan MacMillan). A TATA Trust-funded project conducted by staff of the International Livestock Research Institute (ILRI) called Enhancing Livelihoods through Livestock Knowledge Systems (ELKS) is holding a stakeholder workshop today (28 Feb 2012) on goat value chain development in the mid-hills of northern India’s state of Uttarakhand. Twenty participants are meeting in Dehrudan, the state capital, where ILRI’s Sapna Jarial is based. The coordinator of ELKS, ILRI’s V Padmakumar (Padma), has organized this workshop with Jarial to get concrete recommendations from actors along the whole goat value chain here as to how to substantially improve goat enterprises among poor hill communities in this region. 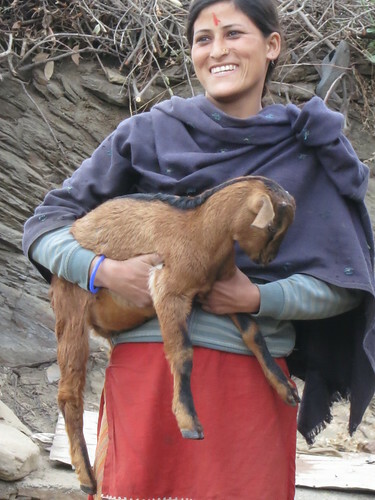 Gita Fartiyal, a goat keeper getting her master’s degree in Hindi literature from Almora University, is paying for her education by keeping 40 goats with her brother in a village in Lambgara Block in Almora District, in India’s northern state of Uttarakhand (picture credit: ILRI/Susan MacMillan). Govind Fartiyal, Gita’s brother, with some of their 40 goats (picture credit: ILRI/Susan MacMillan). Portrait of goat-keeping family, with Gita Fartiyal (left) (picture credit: ILRI/Susan MacMillan). Goats matter here. This state has 1.34 million of them! And there are signs that goats could provide farmers here with a pathway from subsistence to commercial enterprises. 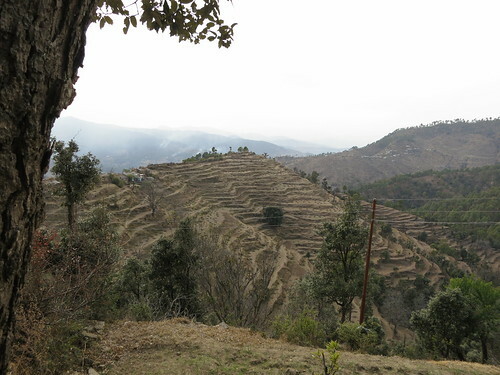 Terraced landscape in a village in Lambgara Block, Almora District, in India’s northern state of Uttarakhand (picture credit: ILRI/Susan MacMillan). 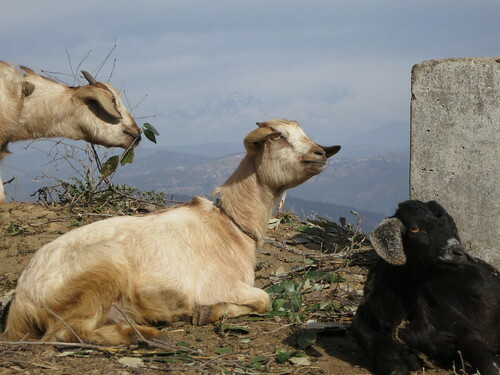 While the focus of the Indian government till now has been on sheep development in this mid-Himalayan region, the sheep population is declining while the goat population is exploding, having increased 10-15% in just 10 years (1997-2007). Only sporadic initiatives support goat development in the state. 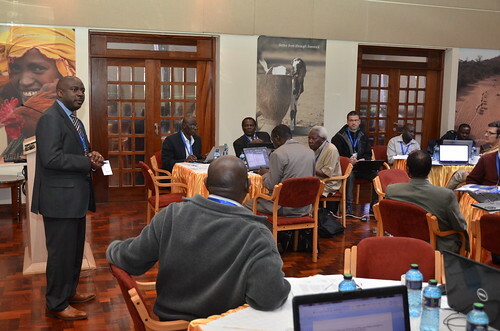 The TATA Trust, ILRI and other participants at this workshop are interested to support this till-now neglected sub-sector through interventions and policies that support better goat health, breeding, feeding and marketing. Mr Gafur, Dehrudan goat trader, and ILRI’s Sapna Jarial at a stakeholder workshop on Goat Value Chain Development, held in Dehrudan, 28 Feb 2012, in India’s northern state of Uttarakhand (picture credit: ILRI/Susan MacMillan). This workshop is tasked with coming with practical ideas for substantially improving the state’s goat production in the next three years. At the same time, since goats here graze common lands under open grazing systems, it is vital that this development does not come at the expense of the fragile mountain environment. ILRI’s V Padmakumar, coordinator of the TATA-funded ELKS project (Enhancing Livelihoods through Livestock Knowledge Systems), listens to discussions at a stakeholder workshop on Goat Value Chain Development, held in Dehrudan, 28 Feb 2012, in India’s northern state of Uttarakhand (picture credit: ILRI/Susan MacMillan). Read more about the ELKS project and check out a recent article about ELKS on the ILRI Asia Blog. Manpai Konyak with his sow in Lampongsheanghah Village, Mon District, Nagaland, India (image credit: ILRI/Ram Deka). Manpai Konyak, a 52-year-old married father of six children, attended elementary school up to class V. All his children used to go to school but two have now left. Konyak and his family reside in a small house made of bamboo and leaves built on a hillside in Lampongsheangha Village, in the Mon District of the state of Nagaland, situated in India’s far northeastern corner. Konyak is a beneficiary of the National Agricultural Innovation Project (NAIP) of the Indian Council on Agricultural Research (ICAR), which is being implemented by ICAR and the International Livestock Research Institute (ILRI). Manpai Konyak is a very poor farmer who cultivates three jhum, or slash-and-burn, fields of paddy rice, maize, millet, colocacia, tapioca, vegetables, and so on. He rotates his jhum plots, each constituting 1–1.5 hectares, every 3–5 years. His plot yields were very low because they were neither irrigated nor fertilized. Konyak’s agricultural production met the food requirements of his household for only four months or so a year, with the family facing acute shortages of food over the other eight months of the year. In addition to farming, Konyak used to earn a small daily wage from labouring, or collecting firewood, or collecting leaves from the forest for making brooms. Daily wages in Lampongsheangh Village were only Indian rupees 50 per day (about USD1), and that was only available to him seasonally. In the off-season, he sold firewood (Rs25 per bundle) or brooms (Rs3 per broom). Konyak also kept some indigenous animal stock: usually 1 pig, 3 cows and 5–7 chickens. He earned Rs7000–9000 every 3–4 years when he sold a fattened pig, as well as about Rs400–500 a year by selling 2–3 chickens. Konyak raised his small native pig in his backyard. He fed it waste from the household kitchen and forages collected from the nearby forest. At first he raised his pigs in the open, with no shed for them, but after a local ban was placed on free-ranging pig production systems, he started rearing his pig in a small (3 ft x 4 ft) enclosure constructed out of tree stems and leaves. He had no access to government, private or community veterinary services and in the absence of such services, most diseased pigs in the village died without treatment. It took Konyak 3–4 years to grow a pig to a weight of 70–80 kg. In the absence of any markets, he used to slaughter or sell a pig within the village every 3 to 4 years, usually during Christmas or Aaoling festivals, earning Rs7000–9000 (USD139–179) each time. Konyak’s wife helped him manage his pigs, but they gave little attention to the animals, as the little income they got from raising them didn’t justify much labour on their part. And in any case, Konyak and his wife had little understanding of good piggery management, and their lack of knowledge and confidence meant they never tried to rear cross-bred pigs for breeding purposes. ILRI started to work in Konyak’s Lampongsheangh Village in early 2008, when ILRI staff visited the village and talked to some of the pig producers about their pig production practices, their problems and scope for improvement. The ILRI staff worked with the community to develop ideas for simple interventions that could improve the village’s pig production and marketing. The villagers and ILRI staff then finalized activities and action plans for implementation. 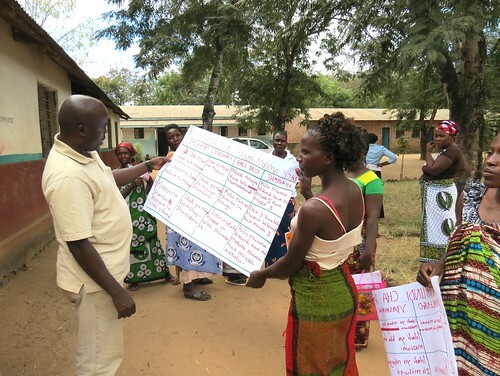 Konyak, like many others, took an active part in these discussions and helped design the following intervention plans, which the villagers then jointly implemented with ILRI staff. Konyak is one of the first people to benefit from the Pass-on-the-Gift scheme implemented by ILRI under NAIP. He attended training on self-help group management, pig management and fodder cultivation delivered by ILRI. He participated in an exposure visit to Dimapur to observe pig management systems and attend a motivational program. These trainings have built his confidence in managing improved pigs for breeding and motivated him to invest more time and energy in managing his pigs. 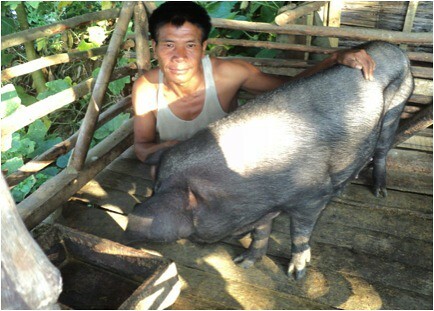 He realized that his piggery operatons could be an importance source of income for him and could transform his livelihood. 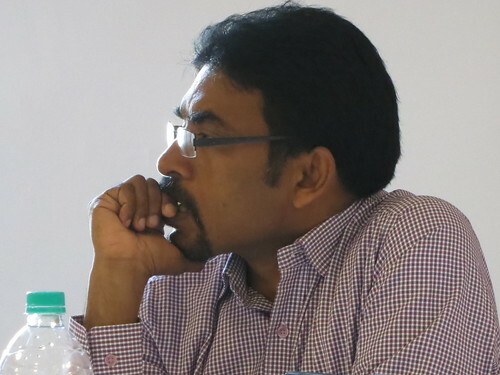 He thus attended all the training programs and worked to follow all the recommendations made by ILRI. 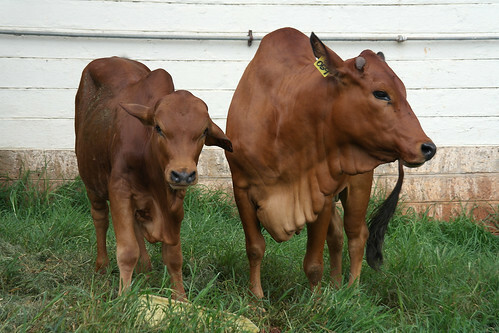 After being trained, ILRI project staff gave him a good-quality Large Black cross-bred female piglet in Sep 2009. As per the precondition, he constructed, with his own investment, a pig sty in a slightly elevated area that had good sunlight and no waterlogging. The shed he built was of sufficient size (8 x 10 ft) to accommodate one sow and her piglets. He used good-quality locally available materials to ensure his pig shed was durable. 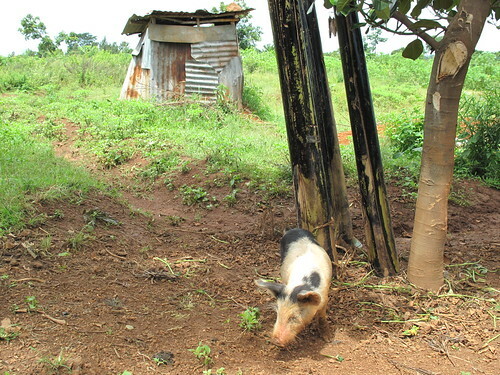 A drain and two manure pits were constructed for easy drainage of the pig waste. The pigs and shed were regularly cleaned to prevent the spread of diseases. (Konyak commented that his pig sty ‘was very dirty prior to the NAIP interventions, but now one can take food or go for sleeping in the pig sty’.) Konyak began to cultivate sweet potato, tapioca, colocacia and maize in a small area in his backyard. He and his wife no longer have to collect forages from the forest with which to feed their pigs, but rather cut and carry their home-grown forages to their pigs. Konyak supplements his forages with some bought concentrates, especially when his sows are pregnant and lactating. If Konyak observes any abnormality in his pigs, he now immediately contacts his local livestock service provider for advice on treating the animal(s). This local service provider visits Konyak’s farm and other farms at least once a week to advise the pig farmers about improved pig production practices and regularly provides them with deworming drugs, liver tonic and mineral and vitamin mixtures. While Konyak formerly spent much of his time on unproductive work, and spent little time looking after his pigs, he now invests a lot of time in his pig rearing, and enjoys taking good care of his sows and piglets. 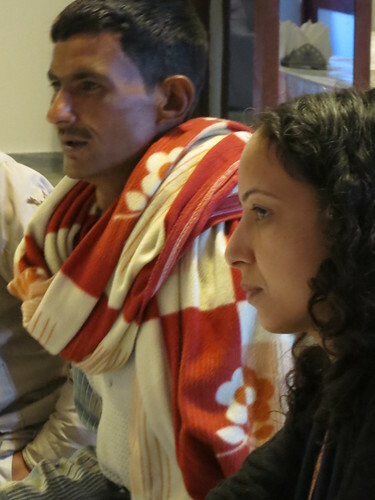 Whereas Konyak used to have to work for a daily wage quite frequently, he now does so rarely. The period during which his household experiences a food shortage has shrunk from 8 to 4 months. He is now living a much more comfortable life than ever before. He has bought a new cell phone and pays the school fees of his school-going children regularly. He recently purchased iron sheets and other construction materials to build a new house for his family. And his new awareness of the need to maintain clean and hygienic pig-keeping practices not only motivated him to keep his pig sty clean but also to improve the personal health and hygiene of his family. After completing construction of his new house, Konyak says he would like to improve his pig sty further. He plans to make the floor of the sty concrete and to put a tin roof over the pen. He also plans to increase the number of sows he keeps from 2 to 5 over the next 2–3 years. Konyak is also taking the lead in installing a feed grinding machine in his village, with technical support from ILRI, and has already collected from his community Rs26,000 for this purpose. 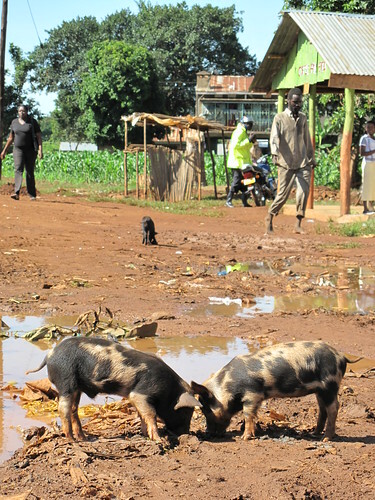 The piglet ILRI supplied to Konyak grew well and was mated with a boar reared by another farmer participating in the project. The pig delivered 7 piglets in Oct 2010; 3 died due to lack of milk by the sow. Of the 4 survivors, Konyak gave one to his down-line beneficiary as a gift, as per the condition of the Pass-on-the-Gift scheme, and sold the other three for Rs2000 each in the village. The sow farrowed twice again in 2011, producing 11 and 9 piglets, respectively. Out of these, 1 piglet died and Konyak kept 1 as replacement stock and sold the remaining 18 in the village for Rs2000 per piglet, thus earning Rs36,000 (USD714). In management his sow, Konyak spent about Rs1600 in 2011, giving him a profit in 2011 of about Rs34,400 (USD680) excluding the cost of labour. Considering the price of the piglet (Rs2000, and note that he received the first piglet free in 2009 from the project) and the cost of managing the pig in 2009–2010, Konyak’s total pig expenses came to some Rs5400, with his total earning during this period about Rs42,000, leaving him with a total profit of about Rs36,600 (USD726) over the two-year period. Konyak has no problems selling his piglets. Many of the farmers from his village and neighbouring villages book the piglets in advance. Other pig farmers in the village, like Konyak, are now rearing pigs for breeding under the NAIP project, and all of this is transforming the village into a major piglet-producing village in the area. The villagers consider the project to be a great success because before the start of the project the village had no pig breeder, forcing them to buy piglets from visiting traders or farmers outside their village. With the help of NAIP, Konyak has become one of the most progressive pig breeders in Lampongsheangha Village. He now encourages other farmers to rear and sell cross-bred pigs for breeding. Konyak says that good breeding, feeding, housing and veterinary care, coupled with his improved knowledge on pig management, have helped him to transform his subsistence pig system into a profitable one. Read more on the ILRI News Blog about ILRI’s pig research in Nagaland. Read an ILRI report: Improving the livelihoods of small-scale pig producers in Northeast India: An integrated, people-centred approach, by Ram Deka and Iain Wright. Nairobi, Kenya: ILRI, 2011. Watch and listen to a 17-minute (audio-enhanced) slide presentation made by ILRI’s Shirley Tarawali on the ‘Sustainable intensification of crop-livestock systems to improve food security and farm income diversification in the Ethiopian highlands,’ 30 Jan 2012. Can scientists make the whole of agricultural research for development greater than the sum of its parts? 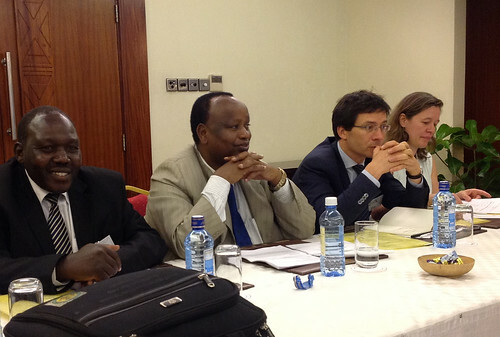 That’s the aim of a new initiative starting this year in three regions of sub-Saharan Africa. As part of an American ‘Feed the Future’ initiative to reduce hunger in sub-Saharan Africa, the US Agency for International Development (USAID) is supporting three agricultural research projects aiming to help Africa’s smallholders intensify their production systems and do so in ways that are sustainable. These projects will be conducted in three regions of Africa: Sustainable intensification of cereal-based farming systems (1) in the Sudano-Sahelian Zone of West Africa and (2) in East and Southern Africa, both led by the International Institute of Tropical Agriculture (IITA), based in Ibadan, Nigeria; and (3) Sustainable intensification of crop-livestock systems to improve food security and farm income diversification in the Ethiopian highlands, led by the International Livestock Research Institue (ILRI). These three African agricultural intensification projects were all launched this year (2012) with design workshops. A wiki has information on the three workshops, including their agendas and outputs. The design workshop for the project in the Ethiopian highlands has just started at ILRI’s campus in Addis Ababa. ILRI’s director for its People, Livestock and the Environment Theme, agronomist Shirley Tarawali, who will soon take up a new position as ILRI’s director of institutional planning, gave a 17-minute slide presentation on the project (above). Tarawali said in her presentation that the project is ambitious to fix the disconnect between separate research projects on separate agricultural topics (livestock, cereals, water, and so on) by identifying and then pulling together the best research outputs from the separate research projects. Such outputs include, for example, the identification of legumes and cereals that will better feed livestock as well as people (and sometimes soils as well); ways to make more strategic use of scarce fertilizers and optimal combinations of organic (manure) and inorganic (synthetic) fertilizers; and more efficient ways to use water resources. Add these kinds of useful products together and we could benefit whole farming systems,’ says Tarawali. To learn more, or to contribute to the discussions, visit a blog about this Feed the Future initiative in the Ethiopian highlands. Read an ILRI Clippings Blog about this initiative: Experts meet in Addis Ababa to design new agricultural research project for Ethiopian highlands, 30 Jan 2012. Seminal and holistic review of the probable ‘futures’ of livestock production, food security and environmental protection, 7 Dec 2011. 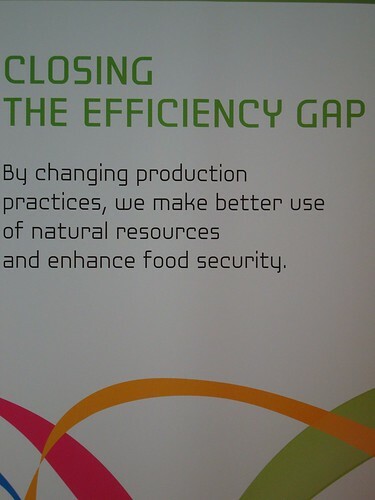 Mixed crop-and-livestock farmers on ‘extensive frontier’ critical to sustainable 21st century food system, 23 Jun 2011. Children of a smallholder pig-farming household in Mon District, Nagaland, in the far northeastern corner of (tribal) India, which is participating in an ILRI project to help the rural poor enhance their production of pigs and pork (photo credit: ILRI/Ram Deka). A new set of training manuals for pig farmers is now available. The manuals inform poor rural pig farmers in developing countries how to ‘intensify’ their production, using lessons gathered from a research-for-development project in India. Among other recommendations, the manuals offer ways of improving smallholder pig farming, including basic veterinary care, and pork production and marketing. The manuals are a result of a project called ‘Livelihood Improvement and Empowerment of Rural Poor through Sustainable Farming Systems in Northeast India’. 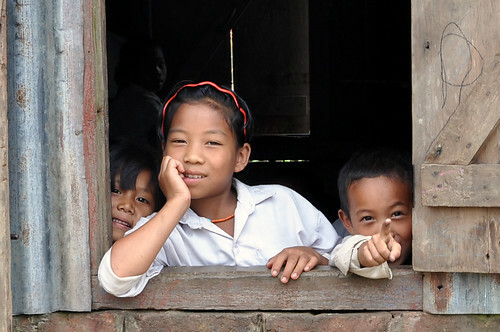 The five-year project, in India’s Assam and Nagaland states, was started in 2007 with funding from the Government of India, the International Fund for Agricultural Development (IFAD), ILRI and the World Bank. 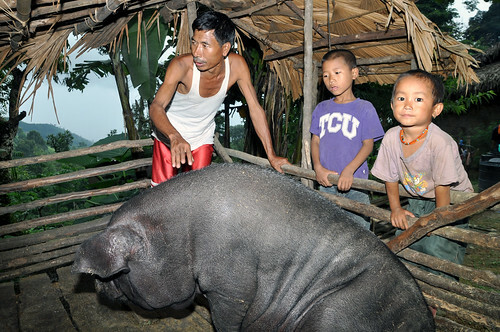 Raising pigs is a particularly important livelihood for smallholders in northeast India, where hilly terrain, poor roads and widespread poverty hamper crop cultivation. ‘Crop farming alone cannot meet the needs of families in these areas and many rely on livestock–mostly pigs and chickens–to supply much needed nutrition and income,’ said Deka. The livelihood improvement project is working with farmers to develop pig production in particular because the region has a history of pig rearing and because keeping pigs requires minimal investments at the outset. Pig production is also easily intensified using locally available resources. There are three well-illustrated manuals. Smallholders’ pig management offers a detailed look at pig systems in India, including features of common breeds, how to care and manage piglets, the reproductive cycle of pigs, breeding methods and how to cultivate feed-food crops. Veterinary first aid for pig offers information on organisms that cause common pig diseases, how to identify them and basic ways of controlling their spread. Hygienic pork production and marketing details how to hygienically process pork, follow slaughterhouse and meat inspection procedures and how to pack and preserve pork for sale. 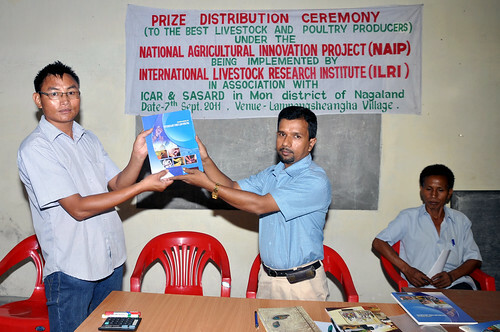 ILRI scientist Ram Deka (middle) distributes training manuals to Livestock Service Providers participating in an ILRI pig production project in the state of Nagaland, in northeast India, 2011 (photo credit: ILRI). The manuals provide easy-to-apply principles in improving pig management, feeding, and care to enhance yields. Farmers in areas where the project is implemented say the manuals are helping them to increase their production. Project staff have set up systems for collecting feedback from farmers and trainers so as to improve future editions of the manuals.